Imagine viewing the plasma membrane of a cell from an interior perspective, with a front-row seat to the process by which substances enter the cell. 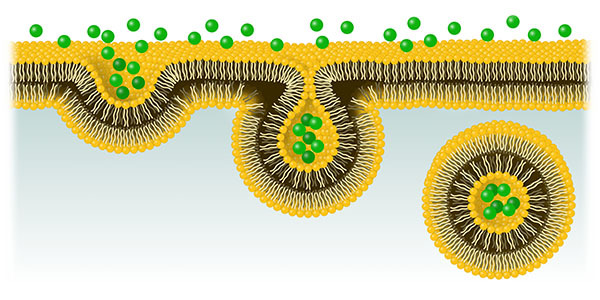 Over in one corner, the plasma membrane begins to bulge inward, forming a sphere stretching toward you with a droplet-shaped neck on the opposite side that remains connected to the cell surface. This sphere, a clathrin-coated vesicle, attracts long protein molecules that self-assemble head-to-tail into structures that coil around the neck of the droplet, pinching it off until it separates from the plasma membrane and becomes wholly incorporated into the cell’s interior. This process is called clathrin-mediated endocytosis, and the elongated protein that acts as a molecular tourniquet to cleave off each vesicle is called dynamin. Its action is powered by hydrolysis of GTP to GDP. And until recently, measuring this GTPase activity with high sensitivity was impossible. The fluorescence polarization assay (Transcreener® GDP FP) uses an antibody that selectively binds and is highly specific for GDP over GTP. As the GTPase activity of dynamin releases GDP, these GDP molecules displace the fluorescence tracer from the antibody, resulting in low fluorescence polarization. Measuring decreased polarization relative to a standard GDP curve thus permits quantification of GTPase activity. Furthermore, conducting assays in absence or presence of potential dynamin-inhibiting compounds enables a highly sensitive, selective, and high-throughput screen. Unfortunately, the scaffold of this compound proved to be unsuitable for further refinement as a drug.1 However, as a proof-of-concept effort, the screen is suitably sensitive and selective for use in identifying additional lead compounds and chemical scaffolds. Since dynamin GTPases are involved in epilepsy and other devastating neurological diseases for which few therapeutic options exist, the possibility of identifying new inhibitors holds promise for patients and clinicians alike. Mohanakrishnan A, Tran TVM, Kumar M, Chen H, Posner BA, Schmid SL. 2017. A highly-sensitive high throughput assay for dynamin’s basal GTPase activity. PLoS One. 12(9):e0185639. Chircop M, Perera S, Mariana A, Lau H, Ma MP, Gilbert J, Jones NC, Gordon CP, Young KA, Morokoff A, Sakoff J, O’Brien TJ, McCluskey A, Robinson PJ. 2011. Inhibition of dynamin by dynole 34-2 induces cell death following cytokinesis failure in cancer cells. Mol Cancer Ther. 10(9):1553-62. Meng J. 2017. Distinct functions of dynamin isoforms in tumorigenesis and their potential as therapeutic targets in cancer. Oncotarget. 8(25):41701-41716. Ferguson SM, Camilli PD. 2012. Dynamin, a membrane remodelling GTPase. Nat Rev Mol Cell Biol. 13(2): 75–88. Daniel JA, Chau N, Abdel-Hamid MK, Hu L, von Kleist L, Whiting A, Krishnan S, Maamary P, Joseph SR, Simpson F, Haucke V, McCluskey A, Robinson PJ. 2015. Phenothiazine-derived antipsychotic drugs inhibit dynamin and clathrin-mediated endocytosis. Traffic. 16(6):635-54.